The Septic Man is here! With all the puns available we've chosen the highroad. 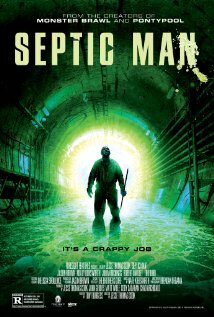 The Septic Man is certainly something different and it looks pretty good. Septic Man stars Jason David Brown, Molly Dunsworth, Robert Maillet & Tim Burd. The film is directed by Jesse Thomas Cook from a script by Tony Burgess.